Minerals have an interesting connection with time and history. There are some that were once considered invaluable and now are sought-after items. Then there are some specimens whose value has reduced with time. Malachite belongs to the latter group of minerals. It is a copper-rich mineral that has been in human use for thousands of year. In this article, we will trace malachite’s imprints in history and its uses throughout the millennium. Apparently, there is no connection between the two. Malachite is a copper-based mineral found in different sedimentary rock formations made of a copper carbonate hydroxide mineral with the formula Cu2CO3(OH)2. Mallow is a perennial plant cultivated everywhere in the world. However, the Greeks saw a striking resemblance of mallow leaves in the green patterned copper mineral and they started calling it by the same name, ‘Moloche’ (mallow in Greek). There is, in fact, a similarity between the ripple-patterned malachite specimens and mallow leaves. Interestingly, this mineral has been mined at Timna Valley in Israel for over 3,000 years, but it was the ancient Egyptians who were the first ones to adopt malachite as an ornamental stone. Some gemology historians are also of the opinion that malachite was in fact first excavated by Egyptians in the region locating between Mount Sinai and Suez somewhere in 4000 BC. The infamous Egyptians hieroglyphs indicate that they were using malachite specimens as a gemstone and for the representation of deities. Romans and Greeks were also fond of malachite as a gemstone. Apart from ornamental uses, they have extended the use of malachite for the making of sculptures and vases. In the 17th century, some large deposits of malachite were found in the Ural Mountains in Russia. The Russians intensely mined malachite and exported it around the world. The deposits were so large that the Russians would even use it as a construction material. 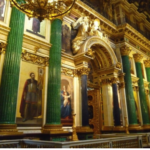 The famous St. Isaac’s Cathedral in St. Petersburg has its pillars made out of malachite. Due to excessive mining for more than two hundred years, Ural Mountains malachite deposits have completely depleted by the mid of 20th century. Malachite is one of those minerals that form within a shallow depth in the Earth’s crust. Geologists have found out that malachite precipitates on copper surfaces from the solutions existing in underground fractures, cavities, and the spaces that exist within porous rocks. Apart from the formation in the copper-rich environment, malachite also forms along with carbonate minerals such as calcite and limestone. In the early days of commercial mining intended to excavate copper deposits, miners excavated large deposits of low quality malachite as a copper ore. The lab treatments would then separate the pure copper from the remaining formula of malachite (carbonate and hydroxide). After the discovery of better quality copper ores, mining companies discontinued the large scale excavation of copper. The malachite deposits mined as copper ores are opaque and non-crystalline and don’t have the appearance that can be faceted into stones and cabochons. The ones used as gemstones have translucent luster in their raw form. The greater value of specific gravity is also one of the revealing properties of gemstone variants of malachite deposits. Gem-grade malachite exhibits the unique optical property that also proves that it’s the real stone instead of its polymer and ceramic replica. In a cold environment, good quality malachite exhibits fizz formation within the stone which looks quite stunning when observed under bright light. It is interesting to mention here that geologists haven’t observed this property in any other green mineral. The vivid green specimens with bright luster are faceted into stones used for several ornamentation purposes. The finest malachite stones are used to make amulets and bracelets. The lesser quality malachite specimens are used as inlay materials and substrates for sculpture making. The unsuitable physical and chemical properties of malachite limit its use in jewelry articles. For instance, it has a really poor hardness rating on the Mohs Hardness Scale (3-4), which makes it extremely susceptible to scratches and abrasions. As the name suggests, this rare specimen is the combination of two minerals: azurite and malachite. Such specimens were formed when these two copper-based minerals undergo intergrowth within the earth crust. Azurmalachite specimens are the impressive stones with natural patterns of blue and green in the form of azurite and malachite respectively. Malachite sometimes grows in turquoise and chrysocolla stones as well. Malachite is not a hard mineral specimen and also exists in opaque form. Due to these properties, people have been grinding it into a pigment since pre-BC era. A soft malachite specimen can easily be crushed into amorphous powder without any machine application. The color of malachite stone doesn’t fade in the sunlight. This property also makes the paint jobs using malachite pigments more long-lasting. Malachite pigment has been used as a green color throughout history. Many Renaissance-era paintings have made heavy use of malachite pigment in them. With the invention of artificial green pigments in the 18th century, the use of malachite as a pigment reduced significantly. These days, only artisans who use historically accurate techniques for their work use malachite pigments. Malachite is not an expensive mineral. However, its synthetic variants are manufactured to supply the sculpture market. It is not that hard to tell apart from real malachite from the fake specimens. The fake ones don’t have the same color and luster. Moreover, the bands and eyes in synthetic stones don’t have natural geometry. The above discussion clearly shows that malachite doesn’t hold the status it once had as a mineral of multiple uses. Nonetheless, people with a penchant for natural stones still use it as an ornamental article.